Watkins Glen State Park and Watkins Glen International (WGI) lie within five miles of each other at the southern end of Seneca Lake in the Finger Lakes region of New York State. The state park features a magnificent natural gorge filled with beautiful waterfalls. WGI is a historical and internationally known racing facility. Watkins Glen State Park (left) and Watkins Glen International (right) lie within five miles of each other in the Finger Lakes region of New York. The Village of Watkins Glen is a quaint town with tantalizing restaurants, unique shops, hotels and inns and boat tours on Seneca Lake. 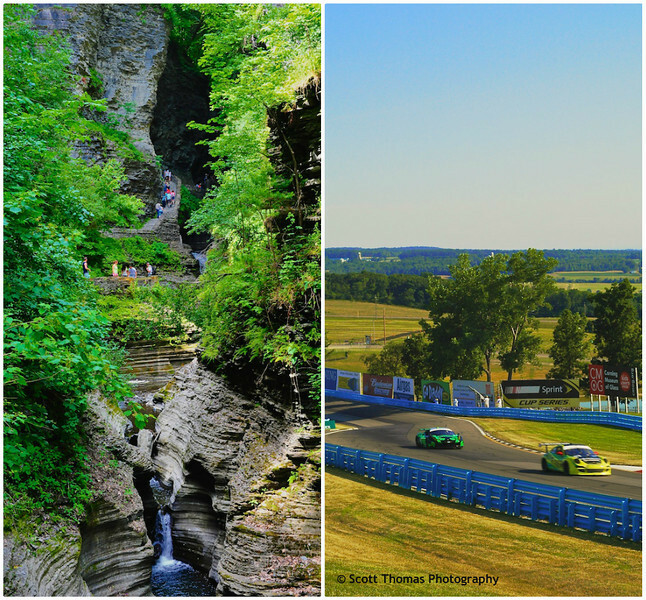 Like many towns in the Finger Lakes region, Watkins Glen relies on seasonal tourism with the added bonus of hosting large racing events which swell the town of 2,500 into the 10’s of thousands. Driving north on NY Route 14 from Watkins Glen to Geneva features several wineries with restaurants and wine tastings along the Seneca Wine Trial. With such natural and man-made attractions, Watkins Glen is a fabulous place to visit. This entry was posted in Travel and tagged 28-300mm, 80-400mm, cars, creek, gorge, international, long exposure, new york, nikon D70, nikon D700, racing, state park, tourism, trail, vr, water, waterfalls, watkins glen, wgi. Bookmark the permalink. If I arrived in these parts of your country, I would immediately go away from the racetrack and into the gorge. And bring my camera! We visited Watkins Glen back in my childhood. Some of our ancestors are from the Finger Lakes areas. That waterfall photo is fabulous!